I recieved a sample of Too Faced Chocolate Soleil Bronzer at Sephora a few weeks ago. This bronzer is a product that combines natural cocoa with the company’s signature bronzing pigments. It smells chocolately and delivers a soft, bronzy glow. 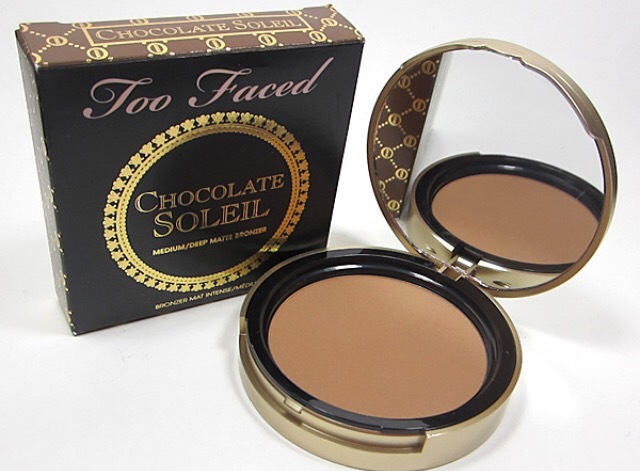 This bronzer is pressed in a small black compact with Too Faced embossed on the cover. It is a slim compact that does not include a mirror. The compact also features a texturized, dotted design around the edges. When you open the cover, the delightful chocolate scent emerges. Because of the drier finish, the bronzer gives the skin a matte finish. It isn’t creamy or soft, but it gives the skin a light bronzy glow. I apply it with an angled blush brush to softly blend it into my skin without dispensing a lot of product. I blend it into my temples, underneath my cheekbones, and the edges of my chin to contour. I use this bronzer when I wish to achieve a lightly bronzed look. In comparison to Benefit Cosmetics Hoola Bronzer, this one is not as intensely pigmented. This bronzer is perfect for giving the skin a pop of colour without overpowering the natural skin tone. Too Faced Chocolate Soliel Bronzer retails for $38 at Sephora.